The White House Blog is the official stream of information from the White House directly to the American people, bypassing the media filter. Oftentimes that means specific information is shared or not shared, and classified conversations are often truncated via a "readout" where a representative of the President summarizes some of the main points that were discussed in a specific conversation or meeting that may have included classified information. MR. SPICER: Good afternoon. I hope you all had the opportunity to pay your respects to the yesterday on Memorial Day. I don't know about you, but I always pay my respects to "the yesterday" everyday and not just on Memorial Day. I want to begin by recapping the incredible, historic trip that the President and the First Lady have just concluded, because it truly was an extraordinary week for America and our people. In just nine days, the President traveled across Europe and the Middle East and interacted with nearly 100 foreign leaders. It was an unprecedented first trip abroad, just four months into this administration, and it shows how quickly and decisively the President is acting to strengthen alliances, to form new partnerships, and to rebuild America’s standing in the world. We’ve never seen before at this point in a presidency such sweeping reassurance of American interest, and the inauguration of a foreign policy strategy designed to bring back the world from growing dangers and perpetual disasters brought on by years of failed leadership. 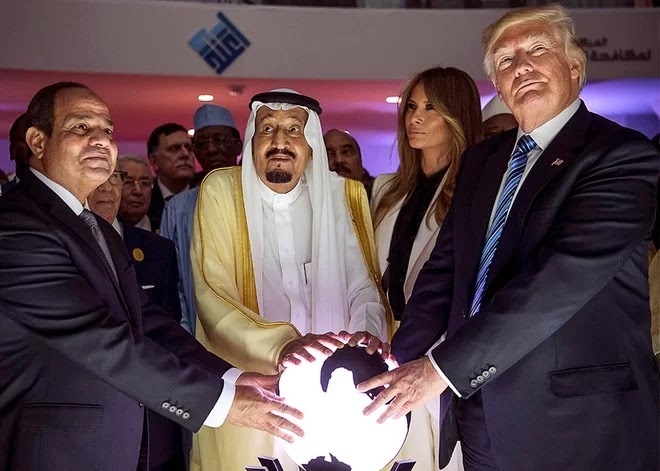 President Trump started in Saudi Arabia, beginning his first foreign trip as President in the nation that’s the custodian to the two holiest sites in the Islamic faith. The President was greeted on the tarmac by the King of Saudi Arabia and received with incredible graciousness by the Kingdom and its leaders throughout his stay. It's been over a week now. Does anyone have any clue what was going on here? The President’s address to the leaders of more than 50 Arab and Muslim nations was a historic turning point that people will be talking about for many years to come. He did exactly as he promised in his inaugural address, united the civilized world in the fight against terrorism and extremism. The President was very direct in calling on the leaders of the region to drive out the terrorists and the extremists from their midst, and to isolate the Iranian regime that supports so much of this violence. Translation: two despots that have overseen the imprisonment and murder of thousands of political dissidents heaped lavish praise on Trump. The visit also included historic economic development deals for the United States, totaling well over half a trillion dollars and the creation of tens of thousands of American jobs. These deals included an immediate $110 billion investment, which will grow to $350 billion over the next 10 years in defense cooperation from Saudi Arabia that will further enable Muslim troops to take on a greater role in further fighting terrorism. Buying surplus outdated weaponry is now considered an investment? The NRA rejoices. The President also participated in the launch of a new task force to block terror funding in the Gulf, the opening of a new Global Center for Combatting Extremist Ideology, and more than 30 commercial deals that include companies like Lockheed Martin, Raytheon, Boeing, GE, Dow, Honeywell, Emerson, Alcoa and Cisco, among others, that will result in an additional $270 billion of Saudi investment in American businesses and American jobs. So that's where we're expected to see the tens of thousands of new jobs? Those companies may in fact add some jobs, but there's no way that this particular deal alone leads to tens of thousands of new jobs at those companies. There's a better chance of this deal being nullified by a US President finally calling Saudi Arabia out for state-sponsored terrorism than this deal leading to significant job creation. The President then went to Israel, where he was received with incredible warmth. He strengthened America’s unbreakable bonds with Israel, made the first-ever visit by a sitting American President to the Western Wall, and gave a highly praised address at the Israel Museum as part of a continuing effort to rally nations together in the fight against terrorism and common enemies. Have we figured out where he thought Israel was? Because he clearly thought he had left the Middle East. 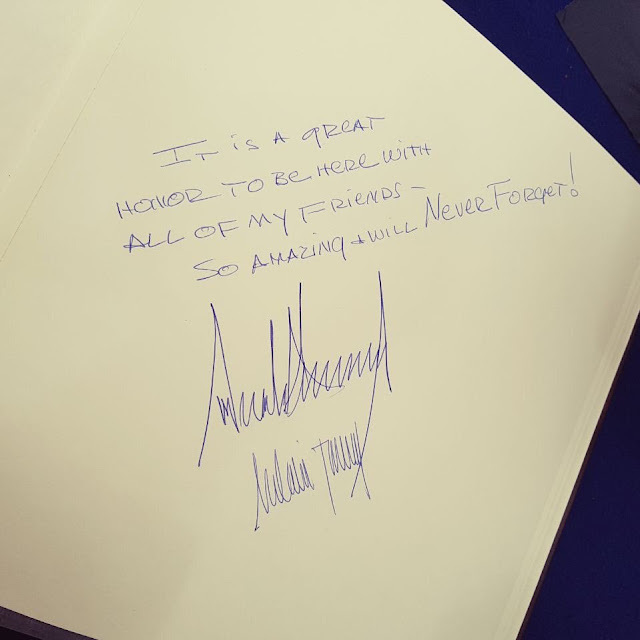 The President also visited Yad Vashem to memorialize the victims of the Holocaust and to pledge, Never Again. Only a sick monster would call images of the Holocaust "so amazing." The President Trump met with both Prime Minister Netanyahu and Palestinian Authority President Abbas to advocate for a renewed push for peace -- which they both agreed they were prepared to work towards. He also discussed with both leaders how to increase cooperation against terrorism. Technically that's correct because Israel announced that they will no longer share intel with the US after Trump leaked Israeli State secrets to the Russians. From Israel, the President traveled to Rome, where he met with Pope Francis at the Vatican. They had a very productive conversation about combatting ISIS and other terrorist groups, protecting religious liberty, and numerous other issues. The President and the First Lady were incredibly honored by the visit. Again, the Pope was just thrilled to be standing next to Trump. The President then attended the NATO Summit in Brussels, where he boldly stood up for American taxpayers and our common defense by calling on the other NATO countries to pay their fair share on a speech delivered with the leaders of NATO’s -- of all of NATO’s countries, all present. Hardworking Americans saw a leader representing them and their security on the international stage. The President also urged NATO to adapt the Alliance to more effectively combat terrorism. Later in the meeting, the member states unanimously agreed on those two priorities, and the Secretary General was extremely complimentary of the President’s work to dramatically strengthen the Alliance by getting member states to increase their contributions. Finally, the President traveled to the G7 Summit in Sicily, where he and other leaders discussed how to better promote prosperity and security for each of their countries. Those meetings were marked by outstanding success that we see reflected in the communiqué that was issued. They include a strong statement that G7 nations will stand against unfair trade practices, and a commitment to fostering a true level playing field. The G7 leaders also endorsed the right of sovereign nations to control their borders, and endorsed in that communiqué the policy outlined by President Trump to seek resettlement of refugees as close as possible to their home countries so that they can be part of their eventual rebuilding. This language on migration and refugees was a major shift in policy toward the position of the President. The G7 formally also condemned the use of chemical weapons. And needless to say, the President’s leadership was critical in setting those priorities for action. One more reminder that everyone was laughing at Trump at NATO and the G7. Everyone. In addition, the President also met with Prime Minister Abe of Japan. The two agreed on the need for enhanced sanctions with respect to North Korea. The President concluded his trip with an address to the service members and their family at Naval Air Station Sigonella, to thank them for their service on Memorial Day weekend and to deliver another strong message about the unity in the fight against terrorism. Then, yesterday, President Trump spoke at Arlington National Cemetery for Memorial Day services and visited the gravestones of many of our fallen heroes. And yet he refused to comment on the murder of a US Army veteran by a Nazi in Portland. This was an extraordinarily successful and historic nine-day trip the President took. He accomplished the return of a strong America to international affairs, rallied civilized nations of the world against terrorism, took real steps towards peace in the Middle East, and renewed our alliances on the basis of both shared interest and shared burdens. The trip sets the stage for a much more safe and more prosperous nation here at home and a more peaceful world for all. We’re back at home now, and the President and his Cabinet are moving full-steam ahead on the President’s agenda. As the President noted this weekend, his plan for the most significant tax reform in decades continues to progress, led by Treasury Secretary Mnuchin and NEC Director Cohn. While the President was away, the team here held several meetings with members and leadership. In particular, Secretary Mnuchin met separately with the House Ways and Means Committee, Republican and Democrat members; the Freedom Caucus; and the Republican Study Committee. The Vice President also discussed tax reform with multiple members and with leadership during his regular visits to Capitol Hill. It's cool they think that $2 trillion tax cut has a chance of happening because it means they're too busy to commit any additional treasonous atrocities. We’ll begin holding industry listening sessions next week, providing an opportunity for business leaders and job creators to give us their inputs on what reforms are necessary to allow us to grow jobs and the economy. This morning, the President met with Environmental Protection Agency Administrator Pruitt. One of the topics that they discussed, of course, was the President’s upcoming decision on the Paris Climate Accords. As I told you overseas, this is the subject that the President is spending a great deal of time on, and one that he spoke to the G7 members about during their meetings. Ultimately he wants a fair deal for the American people and he will have an announcement coming on that shortly. Also today, the President’s Trade Representative, Ambassador Robert Lighthizer is having several meetings with representatives from the Vietnamese government, including the Prime Minister and the Trade Minister, ahead of tomorrow’s visit between the President and the Prime Minister. The U.S. Trade Representative will have readouts on those meetings available for you this afternoon. Ambassador Lighthizer will also be speaking at the Chamber of Commerce gala this evening for the Vietnamese Prime Minister. That speech should be available via the U.S. Chamber’s Facebook page. During his speech, Ambassador Lighthizer will highlight the developments of our bilateral relationships with Vietnam over the past two decades while underscoring the work ahead in addressing the challenges presented by the recent sharp increase in our trade deficit with Vietnam. As the President has made abundantly clear, trade deficits and unfair trade practices have disproportionately hit American workers. Through a robust and varied trade agenda, this administration is strengthening our important relationships with partners like Vietnam by leveling the playing field with American -- for American businesses throughout the world. MR. SPICER: I know. So now you want to come back to that. What I’m telling you is, is that the reason that the President is frustrated is because there’s a perpetuation of false narratives, a use of unnamed sources over and over again about things that are happening that don’t ultimately happen, and I think that is troubling. Q Sean, we reported on the counterterrorism center. Q Is Kushner fake news?